Did you know there is a club just for Caniacs? By joining the Raising Cane’s Caniac Club you’ll get free food, exclusive invites and gear – plus chances to win free tickets to local concerts and sporting events. When you register your card online you will get a free box combo meal (no purchase required), and free food on your birthday. Every time you make a purchase and swipe your card you are instantly entered to win big prizes. Raising Cane’s is a restaurant company that has ONE LOVE- quality chicken finger meals. Cane’s is known for its great crew, cool culture, and active community involvement. Raising Cane’s was founded by Todd Graves in 1996 in Baton Rouge, LA. Raising Cane’s vision is to grow restaurants all over the world and be the brand for quality chicken finger meals, a great crew, cool culture, and active community involvement. 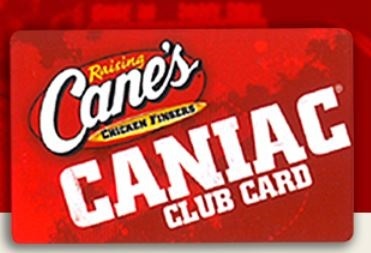 The Caniac Club is a customer appreciation program that has been developed to provide our customers with special THANK YOU offers for being a member. Throughout the year you will receive free food, fun news and more, just for being a member. 1. Simply visit our participating Raising Cane’s locations and ask a crew member for a Caniac Club Card. 2. Go to RaisingCanes.com on the web and click on the CANIAC CLUB page. You’re already SO close! 3. In the REGISTER YOUR NEW CARD area enter the card number located on the back of the card provided. 4. Follow the rest of the instructions and enjoy your Caniac Club privileges. For more information please visit the Caniac Club page on the Raising Cane’s website.